Koni Yellow Shocks BMW 1 Series are not the average shock absorber, they feature a number of standards that make them unique. You can fine tune your BMW's ride and handling with the precision damper adjustments. KONI came out with the first adjustable shock and it is no surprise that they are still the market leader. Koni Yellows are adjustable, which means that you can influence the behavior of the car to meet your preferences (ride comfort, handling balance, etc.). It also means that wear can be compensated. (However, you will probably never need it.) They are designed for a specific car or even special driving conditions. A Koni Yellow Shock is not a simple copy of the original but a tailor made design to get the best handling and ride characteristics from the vehicle. Koni Shocks improve the ride and handling of your car. The damping characteristics are developed for each particular application. Koni's specialists keep on testing and modifying until they are convinced they reached the optimum in both handling and comfort. Do not forget that safety is a major issue. The handling of your car is essential for safe driving. Here the qualities of the Koni shock absorber make a great contribution. Koni Yellow Shocks are built to last a lifetime. Once you have bought a set of Koni's for your car, they usually will outlive it. 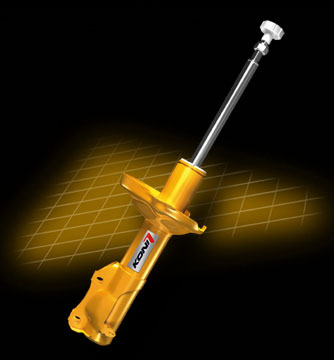 Koni Yellow Shocks carry a lifetime warranty to the original purchaser for as long as you own the vehicle. Koni Yellow Shocks BMW 1 Series are ranked among the best shocks in the industry! KONI, Inc, warrants all new KONI shock absorbers to the original retail purchaser against defects in material and workmanship, excluding mounting rubbers, washers and bushings, when used under normal operating conditions for as long as such purchaser owns the vehicle on which the KONI shock absorbers were originally installed. This warranty does not apply to, and KONI makes no warranty for, shock absorbers that have been installed improperly, as original equipment on any vehicle except Ford Mustang SVO, on any vehicle that has been modified for use other than or in addition to its originally intended use, for an application that is not specified in the KONI literature or on any vehicle that has been used off-road, for racing or for any other driving competition. In the event of defect, malfunction or failure of the KONI shock absorbers to conform with this warranty, the original purchaser must complete the KONI warranty claim form, and return it with the shock absorbers, a copy of the vehicle’s current registration and the dated proof-of-purchase to the dealer from which the shock absorbers were purchased, or to any authorized KONI distributor, or to KONI. Inc. Upon verification, warrantor or its servicing organization will repair or replace the shock absorbers at not cost to the original user; however, warrantor will not pay for the cost of the installation of the new or repaired shock absorbers and the cost of postage and return shipping shall be prepaid by the original purchaser. This warranty gives you specific legal rights and you may have other rights which vary from state-to-state. THIS WARRANTY IS LIMITED SOLELY TO THE ABOVE AND ANY WARRANTIES IMPLIED BY STATE LAW WILL APPLY ONLY FOR THE TERM STATED ABOVE. THE WARRANTOR WILL NOT BE LIABLE FOR ANY LOSS, DAMAGE, INCIDENTAL OR CONSEQUENTIAL DAMAGES OF ANY KIND WHETHER BASED UPON WARRANTY, CONTRACT OR NEGLIGENCE AND ARISING IN CONNECTION WITH THE SALE, USE OR REPAIR OF THE PRODUCT. SOME STATES DO NOT ALLOW LIMITATIONS ON HOW LONG AN IMPLIED WARRANTY LASTS, OR ALLOW THE EXCLUSION OR LIMITATION OF INCIDENTAL OR CONSEQUENTIAL DAMAGE , SO THE ABOVE EXCLUSION MAY NOT APPLY TO YOU. UNLESS OTHERWISE CONTRARY TO STATE LAW GOVERNING THE PURCHASE, THE WARRANTOR’S LIABILITY SHALL NOT, IN ANY CASE, EXCEED THE CONTRACT PRICE FOR THE PRODUCT CLAIMED TO BE DEFECTIVE OR UNSUITABLE. THIS WARRANTY IS APPLICABLE IN THE U.S.A. AND CANADA ONLY. Contact purchasing dealer OR contact KONI, 1961A International Way, Hebron, KY 41048, Attn: KONI Warranty; phone: 859-586-4100 to obtain a Return Goods Authorization number or use www.koni-na.com/warrantyform.pdf. Provide name, address, day phone number, make model & year of vehicle and description of defect. Upon determination of valid warranty KONI will repair or replace at its discretion.